Most of the Latin inscriptions now in the JHU Museum were acquired by Harry Langford Wilson in the winter of 1906-1907 in Rome. Wilson was professor of Roman archaeology and epigraphy at Johns Hopkins and stayed at the American Academy in Rome during the academic year of 1906-1907, which gave him the chance to purchase the inscriptions and have them shipped to Baltimore. The inscriptions were found in several necropoleis (Greek for “cities of the dead”) around Rome, including one outside the Porta Salaria that was being excavated at the time. The Romans buried their dead outside the city gates in order to not pollute the space of the living. Most often, inscriptions were fastened to the outside of the tombs to inform the passer-by of the name and life of the deceased. The inscriptions in the Archaeological Museum range from a few words in length to a long epitaph for a woman that was written in verse and quotes Cato and Seneca. Traditionally, Roman inscriptions were addressed to the Manes, the spirits of the dead who were thought to still reside in or around the tomb. Following this opener, often abbreviated to D M (Dis Manibus), inscriptions recorded the name, age, and other information about the deceased. In general, Latin inscriptions contain many standardized abbreviations. Vixit (he/she lived) is often abbreviated as ‘vix,’ and annis (years) is shortened to ‘ann.’ Many of the epitaphs (from the Greek epitaphion, “a funeral oration”) for men also contain their profession. On some inscriptions the original red paint that filled the letters is still visible. Others display bright red paint which was added later. It was a common practice in the 19th century to “restore” the red paint in order to make the inscription more attractive to a potential buyer. Thirty of the Johns Hopkins Archaeological Museum’s Latin inscriptions are currently on view in the main museum space. Full translations of the inscriptions are given here on this website for all of the objects currently on view. Most of the inscriptions on view in the Museum, as well as some that are in storage, are described in the US Epigraphy Project hosted by Brown University. Matthew Roller, professor of Classics at Johns Hopkins, curated the display of inscriptions you see today and also translated some of the inscriptions. The majority of the inscriptions were translated during the 2011-2012 academic year by Elisabeth Schwinge, a graduate student in the Classics Department. The task of the translator is complex, often requiring multiple modes of inquiry to identify and contextualize the text. The first step in a translation is reading the original text on the stone to become acquainted with the object. In a second step, both Roller and Schwinge consulted the original publications (dating from the early twentieth century) by former JHU Classics professor, Harry Langford Wilson. His publications frequently utilized numerous abbreviations, which themselves had to be deciphered. Finally, the epigraphical tradition of each inscription was studied in order to contextualize it within the framework of Roman commemoration of the dead. All thirty of the Latin funerary inscriptions on view in the museum required conservation treatment before they could be displayed. Most had never been cleaned since they were collected in the early twentieth century while some showed extensive unstable restorations which obscured the original marble surfaces and inscriptions. 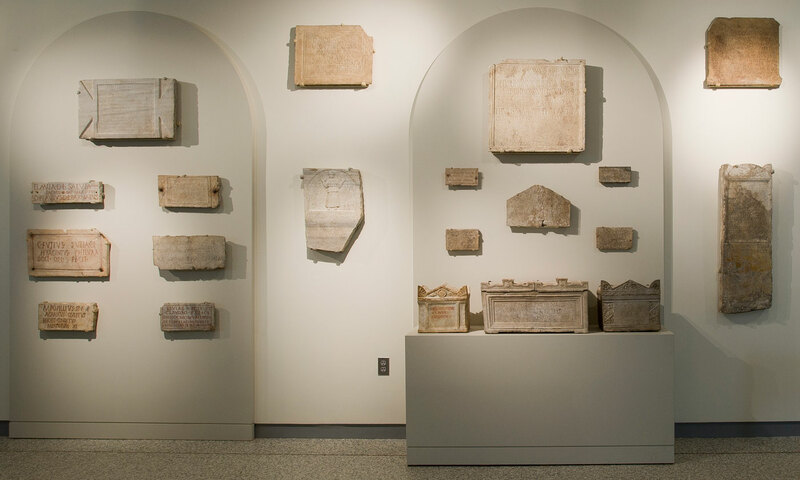 Conservators cleaned and stabilized these objects while mountmakers designed and built custom steel and brass mounts to ensure that these sometimes large and heavy marble slabs could be safely displayed in the museum space. These inscriptions can now once again be easily read and understood.